Ryan Fudger from RIDEbmx came out to East County BMX to cover the Volume Bikes shop stop and came away with this rad video. We stopped at Secret BMX in Temecula, CA the day before and while Secret isn’t in the video, both shop stops went really well. Jason Enns, Broc Raiford, DeMarcus Paul, Josh Clemens, Drew Hosselton, Alex Platt, and Mike Mastroni were all in attendance. Thanks to both shops and everyone who came out. Keep your eye out for more stops too. Rounding out our Volume shop stops today is East County. You all know this will be a good time. As always there will be lots of riding, free stuff, and autographs. 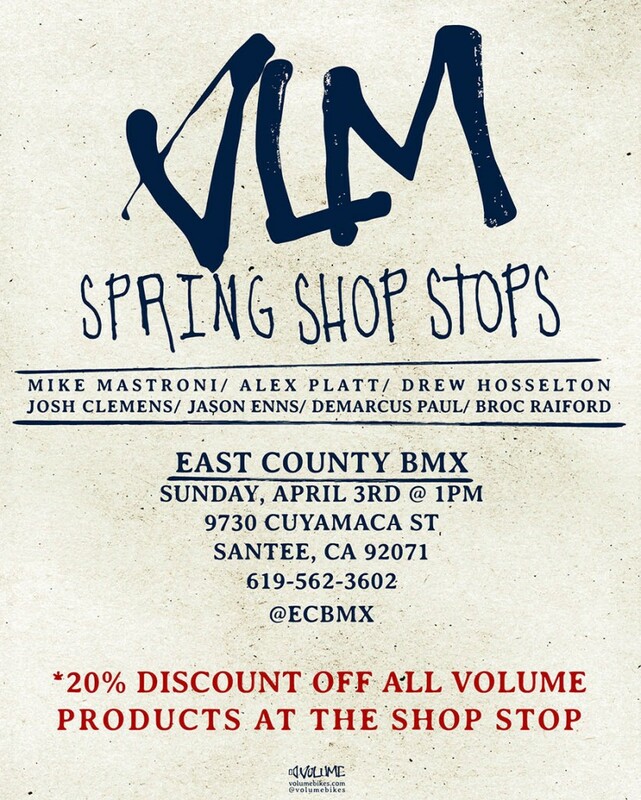 East County will also be offering 20% off all Volume product through the store front today only. Be there! Today and tomorrow are so far the last days you can take advantage of the specials we have going on. 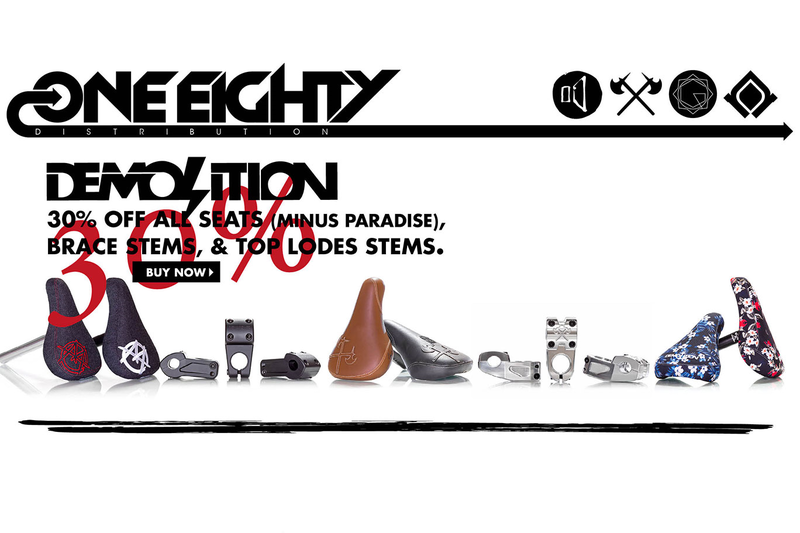 They include 30% off a bunch of Demolition and Volume seats and stems, 15% off Volume 2016 Complete Bikes, and Volume Vessel Frame clearance. Jump on it before they’re gone. Quantities are low. Volume will be at Herb Bauer Bike Shop in Fresno today at 1pm. Get ready! This will be a good time for sure. Freebies, good times, and secret special discounts on Volume product at the shop. Click the flyer to go BIG! 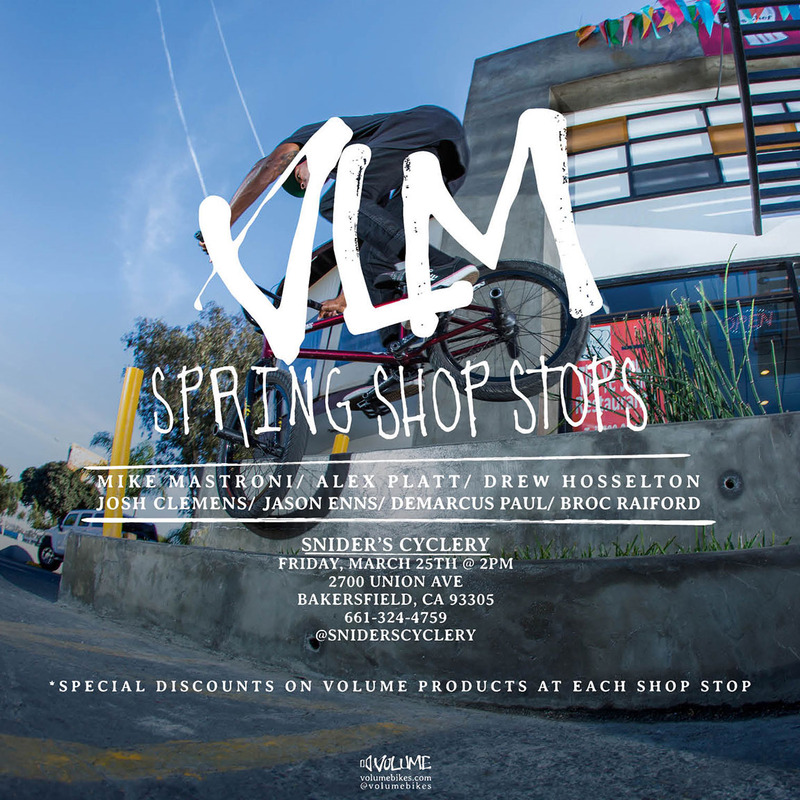 The Volume team will be at Snider’s Cyclery today at 2pm. Don’t forget! There will be riding, signings, posters, good times, freebies, and secret discounts on Volume products at the shop today only! Click the flyer to go BIG! 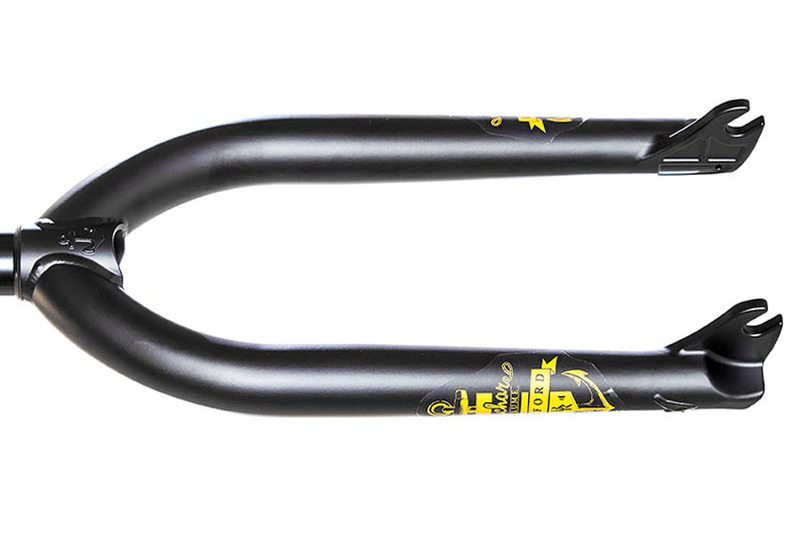 Volume Broc Raiford signature Anchor V2 forks are in stock. 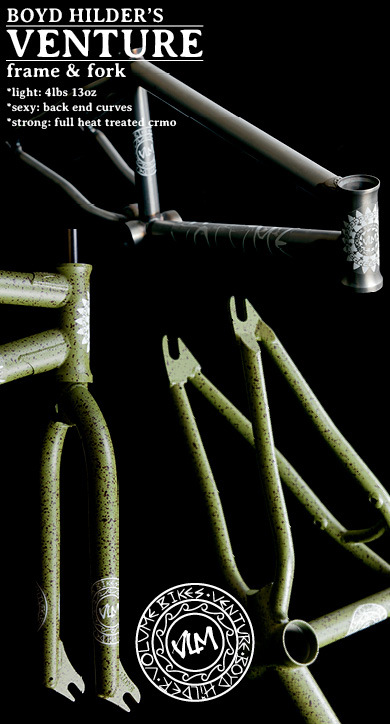 They’re fully heat-treated chromoly, one-piece steerer tube w/integrated race, and tapered legs. The dropouts are full investment casted at 28mm offset for clean nose tricks, and they come with a nice touch of V and anchor logos on the legs and crown. 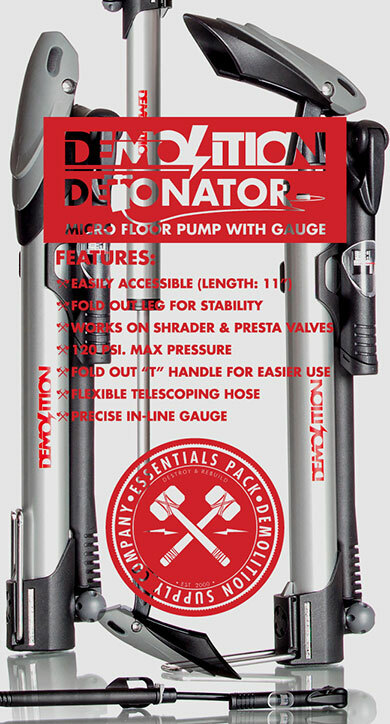 Available in Gloss Black & Chrome, with new colors to come soon. Check the Anchors out HERE>>, and check out Broc’s Anchor promo while you’re at it. 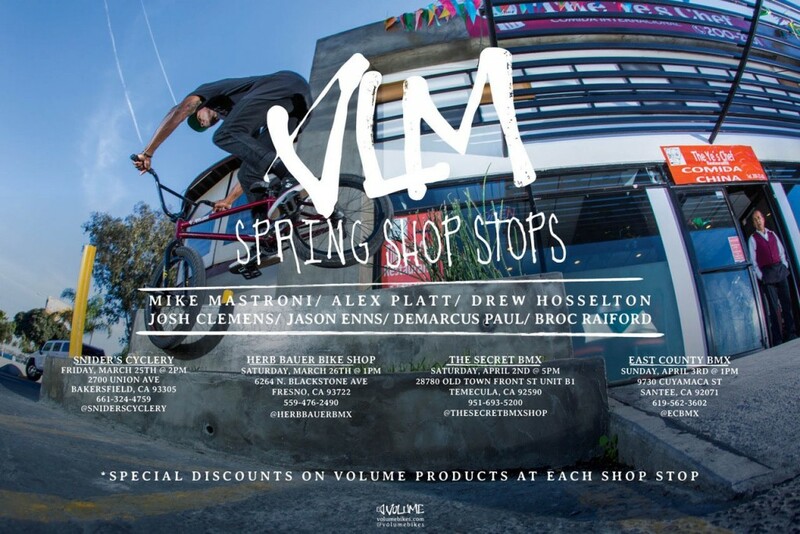 Starting next Friday, March 25th Volume will be on the road shop stopping, and we can’t wait. We always love stopping at our dealers and hanging out with everyone. It’s true BMX. There will be plenty of good times, posters, freebies, and Volume Mystery Specials at each shop stop on Volume product, so make sure you’re there. First up is Snider’s Cyclery next Friday at 2pm with DeMarcus, Mastroni, Broc, Platt, & Clemens. Click the flyer for details and to go BIG! 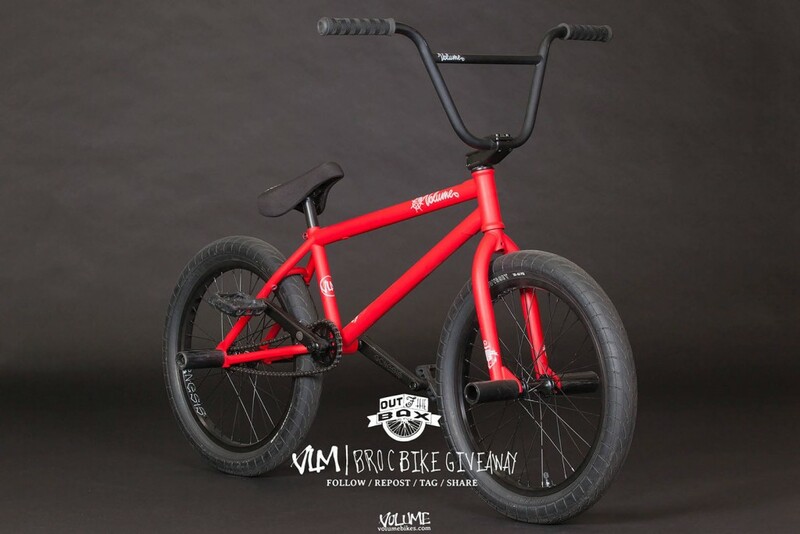 Volume Bikes is giving away a signature 2016 Broc Raiford Complete, and it’s not just any complete. It’s the same complete Broc built up for his RIDEbmx “Out Of The Box” feature that he went all in for. He shredded with this bike, and it’s still solid enough to be passed on and ridden by someone else. Nothing has been changed on it from when he rode it. The only addition he made to it from out of the box was adding plastic pegs. Outside of that, it’s literally right out of the box. Hit up Volume bikes for details on how you can win it, and check out RIDEbmx’s feature after the jump….